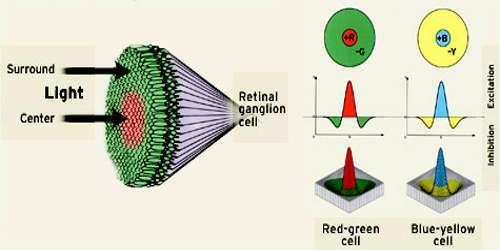 Retinal ganglion cells (RGCs) relay visual information from their cell soma located in the retina, through their axons which project along the optic nerve to the brain. RGCs are found in the innermost layer of the retina. They integrate information from photoreceptors, via the bipolar cells of the retina, and project into the brain, where they synapse at the thalamus, the hypothalamus and the superior colliculus. Some RGCs are themselves photoreceptive; these are believed to be involved in regulating circadian rhythm. Retina amacrine cells particularly narrow field cells, which are important for creating functional subunits within the ganglion cell layer and making it so that ganglion cells can observe a small dot moving a small distance. Retinal ganglion cells collectively transmit image-forming and non-image forming visual information from the retina in the form of action potential to several regions in the thalamus, hypothalamus, and mesencephalon, or midbrain. 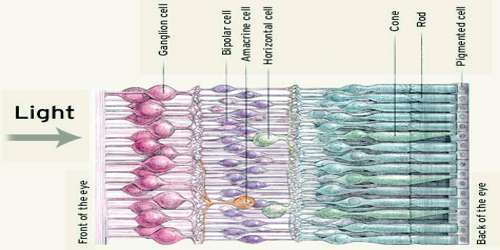 The cell bodies of retinal ganglion cells (RGCs) are located in the ganglion cell layer of the retina, which is located closest to the center of the eye and furthest from the photoreceptor layer on the rear surface of the retina. RGC axons project across the inner surface of the retina until they meet up at the optic disc. At this point, a bundle of RGC axons exits the eye and is called the optic nerve (cranial nerve II). The optic nerves from both eyes meet at the optic chiasm, where the axons segregate by visual fields. Axons from RGCs in the right visual field of both eyes continue into the left optic tract and on towards the left lateral geniculate nucleus (LGN) of the thalamus. A small number of RGC axons also innvervate the superior colliculus and hypothalamus. Axons from RGCs in the left visual field continue into the right optic tract and corresponding brain structures of the right hemisphere. The entire pathway of RGC axons is often referred to as the retinofugal projection. There are approximately 1.6 million RGCs in humans, which transmit integrated information from 125 million photoreceptors. 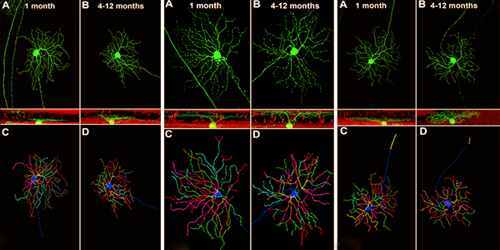 At least 13 distinct types of retinal ganglion cells (RGCs) can be identified by their dendritic morphologies, though some types are better understood than others. M-type, also known as alpha or parasol ganglion cells are believed to be responsible for detecting motion. They have larger cell bodies, and are sensitive to visual stimuli that changes quickly over time. 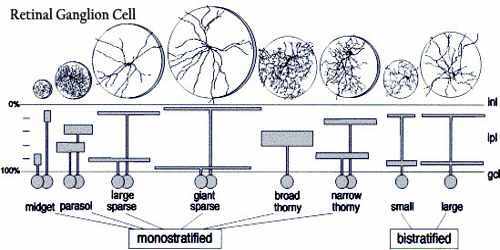 M-type cells have larger receptive fields, and are more sensitive to contrast stimuli, than other types of RGCs. This type of RGC responds to stimuli with a transient burst of action potentials. M-type cells make up approximately 5% of all RGCs. P-type, which is also known as beta or midget ganglion cells are believed to be responsible for detecting details in vision. They have smaller cell bodies than M-type cells, and are sensitive to high-frequency spatial stimuli. P-type cells have smaller receptive fields than M-type cells, are less sensitive to contrast stimuli, and respond to stimuli with a sustained discharge of action potentials as long as the stimulus is present. P-type cells make up approximately 90% of the RGC population. Non-M, non-P types are a diverse group of cell types that make up the remaining 5% of RGCs. Their roles in vision are less understood than M- and P-type ganglion cells, but it is known that some non-M, non-P type cells are involved in color vision. Photoreceptive ganglion cells have a unique role in the visual system. They respond slowly to light stimulus, and maintain a steady signal reflecting the level of light striking the eye. Photoreceptive RGCs “depolarize in response to light by opening cation channels, use an invertebrate-like photopigment (melanopsin), generate action potentials, and connect directly to thalamic and brainstem visual centers. Their primary functional roles relate to non-image-forming visual reflexes, such as circadian entrainment, the pupillary light reflex, and photic regulation of pineal melatonin release”. Once out of the optic chiasm, RGCs will extend dorsocaudally along the ventral diencephalic surface making the optic tract, which will guide them to the superior colliculus and lateral geniculate nucleus in the mammals, or the tectum in lower vertebrates. Sema3d seems to be promoting growth, at least in the proximal optic tract, and cytoskeletal re-arrangements at the level of the growth cone appear to be significant.